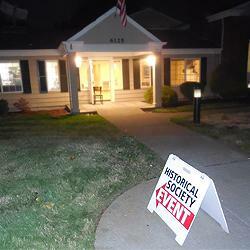 Big Turnout for the Society's First Program in its New Location. 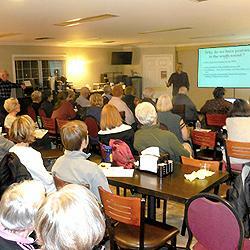 A full house hears the answer to Where Have All the Prairies Gone? 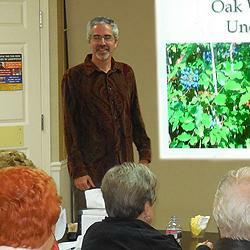 Prof. Fritz's presentation included slides of typical prairie flora and fauna. Be sure to join us for our upcoming programs--see link to them at left. Andy Fritz, instructor of Environmental Sciences at Clover Park Technical College, inaugurated the Best Western Motor Inn Meeting Room (6125 Motor Ave SW) as the new home of the Society's regular programs. 7:00 pm Tuesday, October 23: An entertaining and educational look at the past, present and (sadly uncertain) future of the once-vast prairies of the south Puget Sound region. • Though covering hundreds of square miles when the first white settlers arrived, the prairies were not a natural phenomenon; the original forests had been cleared with fire and the resulting fields maintained for centuries by native tribes. Camas plants and other staples of the Indian diet required more sun than could penetrate the usual thick, evergreen canopy. • The moment their native tenders were forced onto reservations, however, the prairies began to lose ground. The forests were re-establishing themselves, and whatever open land remained was soon under siege from sun-loving, non-native plants the settlers had brought with them—scotch broom being the most notorious example. • Though steadily shrinking, complete extermination of the prairies was avoided--or at least delayed--when farmers, settling in Thurston and Pierce Counties, brought their cows, sheep—and a need for adequate pasture land—with them. Unfortunately, they soon discovered feeding cattle was about all the land--mostly glacial till and gravel--was good for. • Ironically, once the farmers too began to disappear, the same infertile soil affording protection as pasturage became the gravest threat yet to the prairies' existence. For rocky, well-drained, treeless flatlands may not be the best for growing corn, but it's terrific if you're interesed in planting housing developments, strip malls, freeways, etc, etc. Fortunately, a few organizations and volunteers have dedicated themselves to preserving (or restoring) the last few swathes of prairie—but, as the pioneers could have warned them, it's a tough row to hoe. Funding is scarce, and the encroaching evergreens (and developers) never sleep. The brief recap above doesn't do justice to a fascinating evening, so check back for a fuller recounting when we post Andy's PowerPoint—and don't miss the remaining programs of our 2017 season!